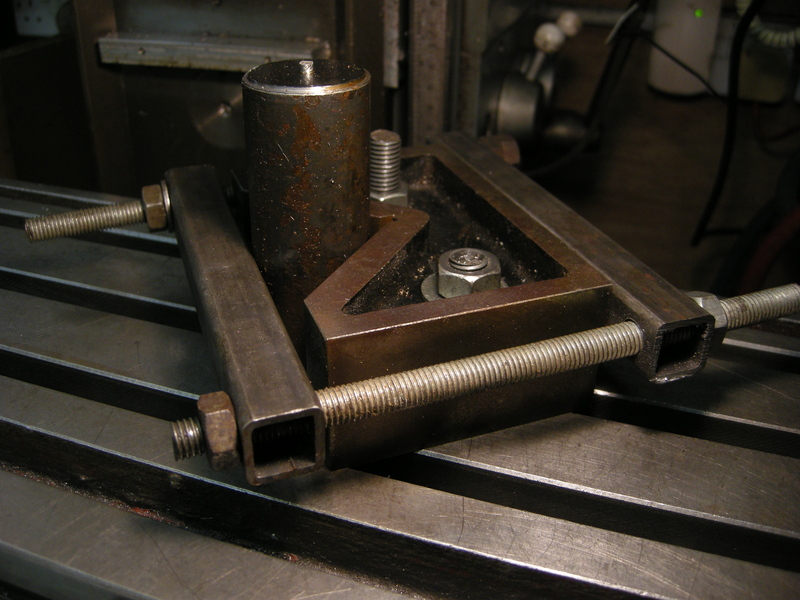 A useful way of holding a workpiece which needs to be bored with one or more parallel holes is by using a Keats block. The Keats block is usually used on the lathe. This is fitted to the face plate. It is equivalent to an angle plate fitted with a V-block and a clamp to hold the workpiece. The advantage of this is that the workpiece is held very rigidly but more important, is that the workpiece can be moved around on the faceplate without any risk of its alignment relative to the faceplate changing. This means that any number of holes in a workpiece can be drilled, reamed and or bored and the will all be parallel to each other. It does not mean that the distances apart will be correct. The slots on the faceplate are at right angles to the slots on the Keats block. This makes it easy to move the Keats block around without any problems. One trick to setting this up is to drill a large center at each point where a hole has to be drilled, bored etc. The Keats block is fitted with the workpiece on the bench. The whole assembly is fitted onto the faceplate. The position of the Keats block on the face plate is set by fitting a center in the tailstock into the center on the workpiece. 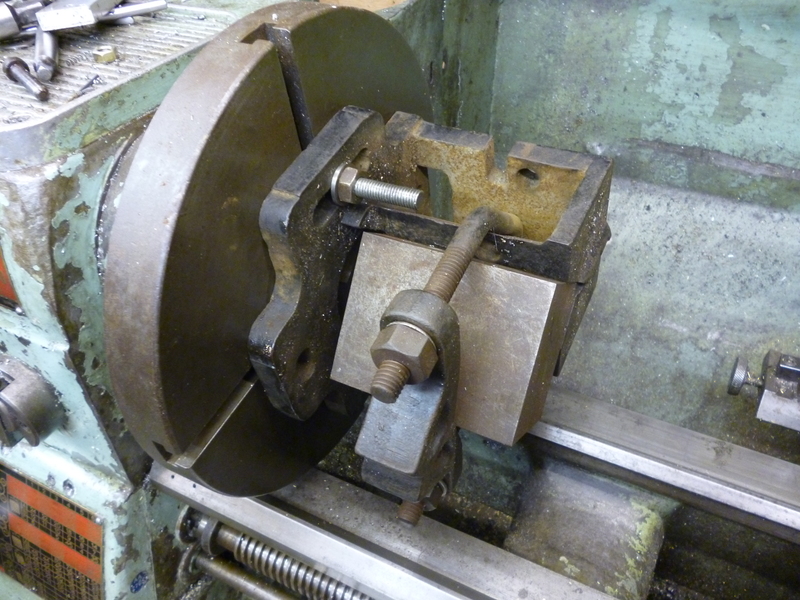 As the tailstock is tightened up the Keats block and workpiece is forced into the required position. If a Keats block is not available then the simplest alternative when using a lathe is to clamp the workpiece to an angle plate and then clamp the angle plate onto the face plate. If the workpiece is round then it could be held in a V-block mounted onto an angle plate etc. 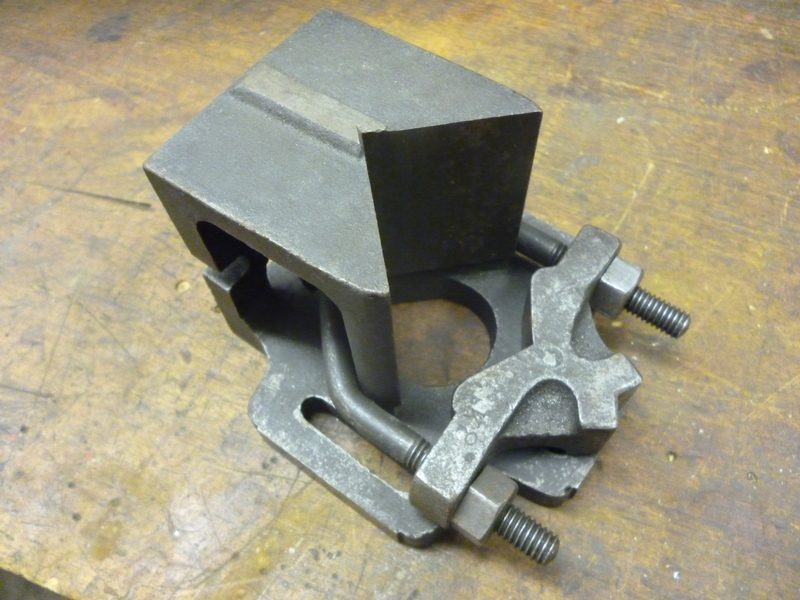 If a Keats block is not available then an equivalent workholding arrangement is a V-block and clamp as shown. A Keats block might be useful as a means of holding a workpiece on a milling machine but the advantage that makes it useful on the lathe is of no benefit on the milling machine. This is because on the milling machine being able to move the workpiece laterally is inherent in the milling machine. Whats more on the milling machine lateral movements can be done very accurately, very easily. If you have a milling machine, a Keats block, in general, is not worth the space it takes up.